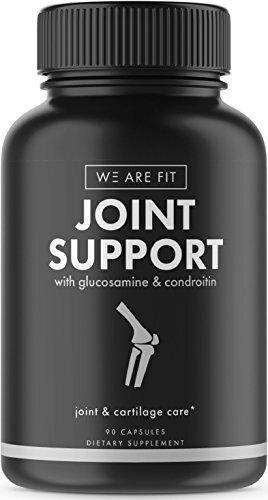 JOINT SUPPORT by WE ARE FIT – The complete joint care supplement! This expert crafted formula contains specific ingredients that may aid in the relief of joint pain, distress, or soreness. Our product is made with the intention to reduce inflammation and ease joint discomfort that comes with repetitive use, excercise, athletic deterioration, or age. GLUCOSAMINE – A natural anti-inflammatory, which may aid in reducing the high levels of stress you have put on your joints. CHONDROITIN – A naturally occurring competent in the human body, which may help to support the joint structure by rebuilding cartilage and other tissues. MSM – A compound that may aid in reducing oxidative stress and inflammation within your joints and protect muscles from being damaged during exercise. Other Powerful Ingredients: Turmeric, Boswellia, Quercetin, Bromelain, and Quercetin. We Are Fit is a health and personal care brand with a desire to promote a natural, healthy, and beautiful lifestyle. Our products are made from only the best natural ingredients. We have a passion to provide safe, superior, and affordable supplements that help men and women of all ages lead healthier and happier lifestyles. Our products are manufactured in the United States in a GMP Certified and FDA Registered Facility. “Add to Cart” now and experience the benefits of our Joint Support! We Are Fit Joint Support supplement is a combination of unique and powerful ingredients that may aid in the relief of joint pain, distress, or soreness. Our product is made with the intention to reduce inflammation and ease joint discomfort that comes with repetitive use, exercise, athletic deterioration, or age. Our maximum strength dietary supplement contains Glucosamine, Chondroitin, and MSM, which may support joints by promoting healthy cartilage, tissue, and collagen. These natural ingredients also may help to protect joint structure and increase joint flexibility & mobility in both men and women. SATISFACTION GUARANTEE – We’re so confident that you’ll love our Joint Support that we’ll refund every penny if you don’t like it! Simply contact We Are Fit directly for a full refund. What do you have to lose?